Zone 2 Tube station on the Piccadilly Line. 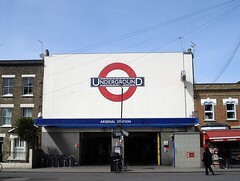 There's a single entrance on Gillespie Road (the original name of the station was in fact "Gillespie Road", and the tiling on the platform walls still bears this name). No facilities to speak of. On days when Arsenal Football Club are playing at home, the station operates a queuing system. Last edited 2013-08-17 09:32:19 (version 8; diff). List all versions. Page last edited 2013-08-17 09:32:19 (version 8).